Ligand-mediated signal transduction of the A204E GHSR1a in transiently transfected HEK293 cells. 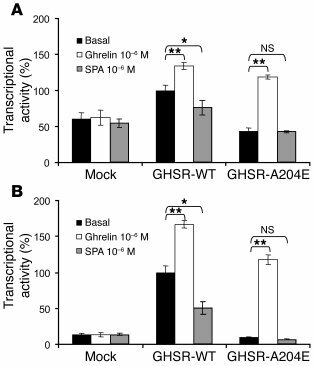 Cells expressing WT GHSR1a, GHSR1a A204E, or mock-transfected cells were incubated either in the absence or in the presence of an agonist (ghrelin at 10–6 M), or of an inverse agonist ([D-Arg1, D-Phe5, D-Trp7,9, Leu11]-substance P, or SPA, at 10–6 M). The transcriptional activity in each condition (RLU/μg proteins) is expressed as a percentage of the basal activity of the WT GHSR1a receptor. Values are the mean ± SD of 1 representative experiment performed in triplicate among 6 independent experiments. *P < 0.05 and **P < 0.01 (ligand-induced signal versus basal level). (A) CRE-mediated transcriptional activity. Cells were cotransfected with 100 ng of each expression plasmid and 250 ng of the pPOU1F1-Luc reporter plasmid. (B) SRE-mediated transcriptional activity. Cells were cotransfected with 10 ng of each expression plasmid and 500 ng of the pSRE-Luc reporter plasmid.